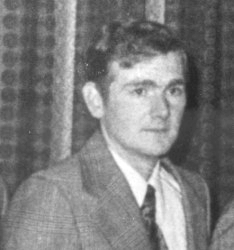 Duncan T. McAleese was married with 3 children. On January 30, 1979, Constable McAleese had arrested and charged a man with impaired driving. Upon conviction the man appealed the decision and was awaiting trial. Several family problems resulted and a hostile feeling developed toward the officer. On January 23, 1980 the man purchased shells, consumed a large quantity of alcohol and talked about killing a cop. He called Constable McAleese at his home, asking whether he could meet him since he had some information about drug traffickers. McAleese left his notes by the phone with a message for his wife to contact the office if he didn't return home. McAleese met the man who was sitting in his pickup truck. He was standing outside the driver's door and speaking briefly when several shots were fired by the man, hitting McAleese in the stomach area. Another six shots were fired at the officer and struck him in the head and chest. He then took off dragging the wounded officer. PC McAleese died at Norfolk General Hospital. Robert Bruce Mitchell had been convicted of impaired driving. He was arrested four hours later after smashing the truck into a hydro pole. He was charged with first degree murder. Mitchell was found not guilty by reason of insanity in court in Newmarket in 1981. He was ordered held at the Penetanguishene Mental Health Centre.